The two newest members of Volkswagen’s burgeoning SUV line-up – the T-Roc compact SUV and practical Tiguan Allspace seven-seat SUV – are now available to order in sporty and stylish R-Line trim. The new range-topping trim level – offered across a selection of engine and gearbox combinations in both model ranges – adds distinctive sports styling inside and out along with equipment upgrades and enhancements commensurate with the top spec’ positioning of the R-Line trim. 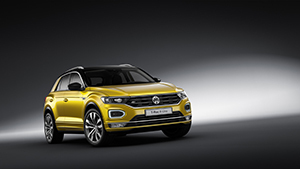 The confident new T-Roc, Volkswagen’s first entrant in the competitive compact SUV class, is already making a name for itself among buyers keen to experience the brand’s renowned build quality, flexible five-seat practicality and refined driving dynamics in an SUV format. Now the arrival of the R-Line trim level adds enhanced visual appeal and uprated handling to the T-Roc’s comprehensive list of appealing features. Additions to T-Roc R-Line models include 19-inch ‘Suzuka’ alloy wheels shod with low rolling resistance tyres; sports suspension; body-coloured roof spoiler and styling pack including R-Line design front and rear bumpers, black wheel arch extensions, body-coloured side skirts and unique R-Line badging. Inside, the T-Roc gains a black roof lining; dark grey decorative inserts in dash and door panels; front footwell illumination; front LED reading lights; Carbon Flag upholstery; chrome R-Line door sill inserts; aluminium pedals; R-Line carpet mats front and rear and a flat-bottomed R-Line leather multi-function steering wheel. The cars are priced from £26,450 RRP OTR. The capacious and practical new Tiguan Allspace can now also be ordered in R-Line trim and, like the T-Roc, the new spec’ level adds styling and equipment upgrades that help this appealing seven-seat SUV stand out from the crowd. Sitting on stunning 20-inch ‘Suzuka’ alloy wheels as standard, the Tiguan Allspace R-Line boasts a sports suspension set-up that can be further optimised via the addition of optional Dynamic Chassis Control which brings with it a choice of Sport, Comfort or Normal suspension settings. Like the T-Roc, the Tiguan Allspace R-Line also features a body-coloured roof spoiler; Piano Black front air intake and rear diffuser and extensive R-Line styling pack. Inside, the R-Line models benefit from the addition of aluminium-look decorative inserts in dash and door panels; a black roof lining; leather trimmed three-spoke multifunction steering wheel with aluminium inserts and ‘R-Line’ logo; ‘Race’ cloth upholstery and ‘San Remo’ microfibre inserts; ‘R-Line’ logo on front seat backrests; stainless steel pedals and unique ‘R-Line’ door sill protectors. The Tiguan Allspace R-Line costs from £35,755 RRP OTR. The new models join a Volkswagen SUV line-up that sits firmly on the foundations of the popular Tiguan range. Now in its second generation, Tiguan is a mainstay of the Volkswagen line-up in the UK and sits third in its sales performance here, behind only Golf and Polo. Later this year the brand will augment its SUV offering still further with the arrival of the flagship new Touareg. Unveiled in China only last month, the luxurious new Touareg brings unprecedented levels of comfort, technology and driving engagement to the class. It will arrive in UK Retailer showrooms this summer. Meanwhile, towards the end of 2018, Volkswagen will unveil the smallest member of its SUV family – the T-Cross. It is expected that this new model, sitting below T-Roc in the line-up and serving as an entry level offering for Volkswagen SUV buyers, will make its way into Volkswagen UK Retailer showrooms in 2019. For more information on the new R-Line models, or to find your local Volkswagen Retailer, please visit www.volkswagen.co.uk.